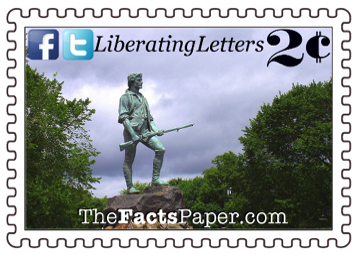 When the British began their late night march towards Lexington and Concord on April 18, 1775, it was not to start a war. Their first goal was to arrest Samuel Adams and John Hancock, the leaders of the American resistance, in Lexington. (see Tree Of Liberty) Next, they were to move on to Concord to seize and destroy the weapons and ammunition obtained by the Patriots. Both Revere and Dawes made it successfully to Lexington, racing to Reverend Jonas Clark’s home where Adams and Hancock were waiting. Turning to Clark, the Founding Fathers asked him if his men were ready. Clark responded, “This is what I have trained them for”. After giving the word to those at the North Church to display “two if by sea,” the pair rode through town, waking up the militia with the warning that “the British are coming.” The lanterns in the steeple informed the Patriots in the countryside of the British’s advancement. Sparing only a few moments to catch their breath, Revere and Dawes set out to cover the several miles to Concord. On the way, Revere and Dawes met another Patriot named Samuel Prescott, who joined their mission. The trio was stopped by a British patrol, who captured Revere. Dawes escaped with his life, but not his horse, as he was thrown off during the excitement. He walked back to Lexington, unable to advance to Concord. Prescott successfully completed the mission, alerting Concord’s militia of the British’s plans. When the British arrived in Lexington in the early morning of April 19th, they were confronted by a small band of Minutemen, including 150 from Clark’s own congregation, as well as other Patriots willing to fight for their rights and religious freedom. Assembling at Lexington Green, the colonists realized they were vastly outnumbered. While the Patriots began wondering what to do next, a shot rang out across the green causing a furry of British gunfire to engulf the field. The militiamen returned fire in defense of their eight men that were killed immediately. Once order was restored, nine others were found wounded with only one British soldier injured. Clark’s men fought and died protecting Adams and Hancock from sure execution, who instead were able to escape to Philadelphia. Revere joined them after being interrogated and released by the British. The Patriots were down but they were in no way out. Unable to capture Adams and Hancock, the British troops were still charged to confiscate and destroy the Patriots’ munitions. Fortunately, the orders had been leaked beforehand allowing the Patriots time to move and secure their provisions in other locations. Once in Concord, the British began searching private homes and buildings, seizing supplies and firearms, thusly removing the colonists’ ability to resist the tyranny they were under. As ordered, the British started a fire to burn what they had confiscated, which soon began to loose control. In fear of their town going up in flames, the militia took action. Hundreds of militiamen had regrouped in Concord. This time they were not so easily shaken, especially after what had happened in Lexington. The colonial offensive took place at the North Bridge, which was being defended by a group of British soldiers. When the Patriots advanced and the British opened fire, the Patriots were ready to respond. Militiamen, hiding behind buildings and trees, began firing among the British, killing over 100 soldiers and several officers. The British retreated, returning to Boston after being bested this time by the colonists. Ralph Waldo Emerson immortalized this battle in a poem, denoting it as “The Shot Heard Round The World.” Others claim it as the first shot in Lexington. Either way, these two battles on April 19, 1775, designate the moment the colonists’ took their fate into their own hands. The world now knew the American Revolution had begun and there were people in the world willing to fight for liberty. The struggle for freedom had finally left parliament and entered the battlefield. Liberty, we should always try to resolve differences such as these with words and understanding. It was years since the 1770 Boston Massacre and 1773 Boston Tea Party (see Tyrants And Tea Parties) before the Patriots had to finally pick up their arms against the government. And that only happened because the government started coming after those guns. Before this, there were years and years of talks Benjamin Franklin and others had with the British, pleading their case to be free from under the boot of the crown. Unfortunately, since sin, greed and authoritarianism rule this world, there may come a time when arms must be raised to save lives and liberty. We must be slow to this point, searching for God’s blessing, but when it comes, do not be afraid. When the British were returning to Boston, members of Clark’s church, as well as others, stood on the roadside quietly informing the British that they were not going to be forced by the crown to worship the way King George told them. Many of the colonists were willing to fight and die for their right to worship God as they chose. When the Founders began to write the Constitution, events of this day profoundly influenced the rights they guaranteed the American people. The American Revolution began as a direct result of the British’s initial two orders. Americans, led by Adams and Hancock, were fighting for their religious freedom. They did not want to be controlled on what to say, how to worship, or denied the right to speak - 1st Amendment. By capturing Adams and Hancock, the British aimed to stop any more advancement of this rebellion. They planned to completely eliminate any further possibility of it by removing the colonists’ ability to fight for that freedom by confiscating the colonists’ guns - 2nd Amendment. As I stated in The Forgotten Founding Father, “Colonists had been taught the idea of Independence, free from the oppression of the crown and the state church, since Whitefield starting touring the colonies in 1740.” Others, like Clark, continued this crusade throughout the mid-1700’s. Religious freedom is in America’s DNA. When the time came, Liberty, Clark and others took off their black preacher robes and donned a uniform. (see Who Among You Is With Me?) There is a time for peace, and sometimes, there is a time for war.